The annual Bebras challenge provides a lot of data for making inquiries on how students accept Informatics concepts, how they develop computational and algorithmic thinking, what type of tasks help attract them and motivate for further involvement, etc. Some countries started to develop research papers year by year. Other countries have published overviews of tasks with detailed explanations how to solve them and what Informatics concepts are behind. There are articles for promotion Bebras challenge in particular country also articles dealing with particular contest results. If a paper is available for free the scanned copy is provided (with bibliographical metrics). If a paper is available online, the link is provided. Also video about Bebras Challenge can be found at "Link to publication". Curran, J., R., Schulz, K., A., Hogan, A. (2019). Coding and Computational Thinking - What is the evidence? (report). NSW Department of Education. Wiebe, E., London, J., Aksit, O., Mott, B. W., Boyer, K. E., & Lester, J. C. (2019, February). Development of a Lean Computational Thinking Abilities Assessment for Middle Grades Students. In Proceedings of the 50th ACM Technical Symposium on Computer Science Education (pp. 456-461). ACM. Araujo, A. L. S. O., Andrade, W. L., Guerrero, D. D. S., & Melo, M. R. A. (2019, February). How Many Abilities Can We Measure in Computational Thinking? : A Study on Bebras Challenge. In Proceedings of the 50th ACM Technical Symposium on Computer Science Education (pp. 545-551). ACM. Pluhár, Z., Gellér, B. International Informatic Challenge in Hungary. In: Teaching and Learning in a Digital World : Proceedings of the 20th International Conference on Interactive Collaborative Learning. Berlin, Germany: Springer, (2018).pp. 425-435. Chiazzese, G., Arrigo, M., Chifari, A., Lonati, V., & Tosto, C. (2018, October). Exploring the Effect of a Robotics Laboratory on Computational Thinking Skills in Primary School Children Using the Bebras Tasks. In Proceedings of the Sixth International Conference on Technological Ecosystems for Enhancing Multiculturality (pp. 25-30). ACM. Lutz, C., Berges, M., Hafemann, J., & Sticha, C. (2018, October). Piaget’s Cognitive Development in Bebras Tasks-A Descriptive Analysis by Age Groups. In International Conference on Informatics in Schools: Situation, Evolution, and Perspectives(pp. 259-270). Springer, Cham. van der Vegt, Willem. How Hard Will this Task Be? Developments in Analyzing and Predicting Question Difficulty in the Bebras Challenge. Olympiads in Informatics, Vol. 12, 119-132. Manabe, H., Tani, S., Kanemune, S., & Manabe, Y. (2018). Creating the Original Bebras Tasks by High School Students. Olympiads in Informatics, Vol. 12, 99-110. Dagienė, V. (2018). Resurgence of Informatics Education in Schools. In Adventures Between Lower Bounds and Higher Altitudes (pp. 522-537). Springer, Cham. Chen, J. M., Wu, T. T., & Sandnes, F. E. (2018, August). Exploration of Computational Thinking Based on Bebras Performance in Webduino Programming by High School Students. In International Conference on Innovative Technologies and Learning (pp. 443-452). Springer, Cham. Ungyeol Jung & Young-Jun Lee. The Direction and Possibility for Social Justice in Informatics Education based on Bebras Challenge in Korea. In Conference Constructionism’18, Vilnius, Lithuania, 278-287, 2018. Boom, K. D., Bower, M., Arguel, A., Siemon, J., & Scholkmann, A. (2018, July). Relationship between computational thinking and a measure of intelligence as a general problem-solving ability. In Proceedings of the 23rd Annual ACM Conference on Innovation and Technology in Computer Science Education (pp. 206-211). ACM. Soojin Jun, Yongju Jeon, Seulgi Kim, Doyong Kim, Inkee Jeong. Elementary School Students' Level of Computational Thinking through Bebras Challenge 2017. Journal of The Korean Association of Information Education, 22(3), 2018. Ungyeol Jung, Hakin Kim, Min Hyuk Lee, Hyeonah Lee, Seongjin Ahn. A Study on the Factors Influencing Computational Thinking Ability of Secondary School Students in Bebras Challenge 2017. The Journal of Korean association of computer education, 21(3), 2018. Bellettini, C., Carimati, F., Lonati, V., Macoratti, R., Malchiodi, D., Monga, M., & Morpurgo, A. A platform for the Italian Bebras. In Proceedings of the 10th international conference on computer supported education (CSEDU 2018) (Vol. 1, pp. 350-357). Heintz, F., & Mannila, L. (2018). Computational Thinking for All: An Experience Report on Scaling up Teaching Computational Thinking to All Students in a Major City in Sweden. In ACM Technical Symposium on Computer Science Education (SIGCSE). Moreno-León, J., Román-González, M., & Robles, G. (2018, April). On computational thinking as a universal skill: A review of the latest research on this ability. In Global Engineering Education Conference (EDUCON), 2018 IEEE (pp. 1684-1689). IEEE. Pérez, A. D. F., & Valladares, G. M. (2018, April). Development and assessment of computational thinking: A methodological proposal and a support tool. In Global Engineering Education Conference (EDUCON), 2018 IEEE (pp. 787-795). IEEE. Djambong, T., Freiman, V., Gauvin, S., Paquet, M., & Chiasson, M. (2018). Measurement of Computational Thinking in K-12 Education: The Need for Innovative Practices. In Digital Technologies: Sustainable Innovations for Improving Teaching and Learning (pp. 193-222). Springer, Cham. Lockwood, J., & Mooney, A. (2018). Computational Thinking in Secondary Education: Where Does It Fit? A Systematic Literary Review. Online Submission, 2(1), 41-60. Rosamond, F. (2018). Computational Thinking Enrichment: Public-Key Cryptography. Informatics in Education, 17(1). Hammer, S., Zehetmeier, D., Böttcher, A., & Thurner, V. (2018, April). Evaluation of a diagnostic test for cognitive competences that are relevant for computer science: Detailed focus on methodical competences. In Global Engineering Education Conference (EDUCON), 2018 IEEE (pp. 616-623). IEEE. T. Palts, M. Pedaste, V. Vene, L. Vinikienė (2017). Tasks for Assessing Skills of Computational Thinking. ICERI2017 Proceedings. Pages: 2750-2759. Ungyeol Jung, Young-Jun Lee (2017). The Applicability and Related Issues of Bebras Challenge in Informatics Education. The Korean Association of Computer Education, Vol. 20(5), p. 1-14. Budinská, L., & Mayerová, K. (2017, November). Graph Tasks in Bebras Contest: What does it have to do with gender?. In Proceedings of the 6th Computer Science Education Research Conference (pp. 83-90). ACM. Román-González, M., Pérez-González, J. C., & Jiménez-Fernández, C. (2017). Which cognitive abilities underlie computational thinking? Criterion validity of the Computational Thinking Test. Computers in Human Behavior, 72, 678-691. Dagienė, V., Stupurienė, G., & Vinikienė, L. (2017, October). Informatics Based Tasks Development in the Bebras Contest Management System. In International Conference on Information and Software Technologies (pp. 466-477). Springer, Cham. Calcagni, A., Lonati, V., Malchiodi, D., Monga, M., & Morpurgo, A. (2017, November). Promoting Computational Thinking Skills: Would You Use this Bebras Task?. In International Conference on Informatics in Schools: Situation, Evolution, and Perspectives (pp. 102-113). Springer, Cham. Budinská, L., Mayerová, K., & Veselovská, M. (2017, November). Bebras Task Analysis in Category Little Beavers in Slovakia. In International Conference on Informatics in Schools: Situation, Evolution, and Perspectives (pp. 91-101). Springer, Cham. Pluhár, Z., & Gellér, B. (2017, September). International Informatic Challenge in Hungary. In International Conference on Interactive Collaborative Learning (pp. 425-435). Springer, Cham. Lonati, V., Malchiodi, D., Monga, M., & Morpurgo, A. (2017, June). Bebras as a Teaching Resource: Classifying the Tasks Corpus Using Computational Thinking Skills. In Proceedings of the 2017 ACM Conference on Innovation and Technology in Computer Science Education (pp. 366-366). ACM. Dagienė, V., Stupurienė, G., & Vinikienė, L. (2017). Implementation of Dynamic Tasks on Informatics and Computational Thinking. Baltic Journal of Modern Computing, 5(3), 306. Ozcinar, H., Wong, G., & Ozturk, H. T. (Eds.). (2017). Teaching Computational Thinking in Primary Education. IGI Global. ROMÁN-GONZÁLEZ, M., MORENO-LEÓN, J., & ROBLES, G. Complementary Tools for Computational Thinking Assessment. In Proceedings of the International Conference on Computational Thinking Education 2017, Hong Kong, pp. 154-159. Palts, T., & Pedaste, M. (2017, June). Tasks for Assessing Skills of Computational Thinking. In Proceedings of the 2017 ACM Conference on Innovation and Technology in Computer Science Education (pp. 367-367). ACM. Dagienė, V., Sentence, S., Stupuriene, G. (2017). Developing a Two-Dimensional Categorization System for Educational Tasks in Informatics. Informatica, 28(1), 23-44. C. Izu, C. Mirolo, A. Settle, L. Mannila, G. Stupurienė (2017). Exploring Bebras Tasks Content and Performance: A Multinational Study, Informatics in Education, Vol. 16 (1), 39-59. Rodriguez, B., Kennicutt, S., Rader, C., & Camp, T. (2017, March). Assessing Computational Thinking in CS Unplugged Activities. In Proceedings of the 2017 ACM SIGCSE Technical Symposium on Computer Science Education (pp. 501-506). ACM. Chen, G., Shen, J., Barth-Cohen, L., Jiang, S., Huang, X., & Eltoukhy, M. (2017). Assessing elementary students’ computational thinking in everyday reasoning and robotics programming. Computers & Education, 109, 162-175. Lockwood, J., & Mooney, A. (2017). Computational Thinking in Education: Where does it Fit? A systematic literary review. arXiv preprint arXiv:1703.07659. Dagienė, V., Stupurienė, G. Bebras – a Sustainable Community Building Model for the Concept Based Learning of Informatics and Computational Thinking. Informatics in Education, Vol. 15 (1), 25-44, 2016. Tomcsányiová, M., Tomcsányi, P., & Hrušecký, R. (2016, November). Programming little educational applications. In Emerging eLearning Technologies and Applications (ICETA), 2016 International Conference on (pp. 355-358). IEEE. Bocconi, S., Chioccariello, A., Dettori, G., Ferrari, A., & Engelhardt, K. (2016). Developing Computational Thinking in Compulsory Education-Implications for policy and practice (No. JRC104188). Joint Research Centre (Seville site). Á. Erdősné Németh, L. Zsakó (2016): The Place of the Greedy Method Concept in the Progression of Contestants' Thinking. EDUKACJA TECHNIKA INFORMATYKA / EDUCATION TECHNOLOGY COMPUTER SCIENCE 2016, pp. 6. Dagiene, V. (2016, September). Challenge to Promote Deep Understanding in ICT. In IFIP World Information Technology Forum (pp. 47-52). Springer International Publishing. Dagiene, V. (2016). Bringing Informatics Concepts to Children Through Solving Short Tasks. Bulletin of EATCS, 1(118). Rodriguez, B. R. (2016). Assessing computational thinking in Computer Science Unplugged activities (Doctoral dissertation, Colorado School of Mines. Arthur Lakes Library). Dagienė, V., Stupurienė, G., & Vinikienė, L. (2016, June). Promoting Inclusive Informatics Education Through the Bebras Challenge to All K-12 Students. In Proceedings of the 17th International Conference on Computer Systems and Technologies 2016 (pp. 407-414). ACM. Á. Erdősné Németh, L. Zsakó. (2016). The Place of the Dynamic Programming Concept in the Progression of Contestants' Thinking. Olympiads in Informatics. Volume 10. Pozdnyakov, S., Kirynovich, I., Posov, I., (2016). Contest Bebras on Informatics in Russia and Belarus. Olympiads in Informatics. Volume 10 (Special Issue), 55-65. W. van der Vegt. (2016). Bridging the Gap Between Bebras and Olympiad; Experiences from the Netherlands. Olympiads in Informatics. Volume 10. S. Combéfis, G. Beresnevičius, V. Dagienė. (2016). Learning Programming through Games and Contests: Overview, Characterisation and Discussion. Olympiads in Informatics. Volume 10. Dagienė, V. Futschek, G., Stupurienė, G. (2016). Teachers’ Constructionist and Deconstructionist Learning by Creating Bebras Tasks. In Conference Constructionism’16, Bangkok, Thailand, 257-264. Dagienė, V. Futschek, G., Stupurienė, G. (2016). Developing Computational Thinking by Using Constructionist and Deconstructionist Learning (Workshop). In Conference Constructionism’16, Bangkok, Thailand, 360-361. Stupurienė, G., Vinikienė, L., & Dagienė, V. (2016, October). Students’ Success in the Bebras Challenge in Lithuania: Focus on a Long-Term Participation. In International Conference on Informatics in Schools: Situation, Evolution, and Perspectives (pp. 78-89). Springer International Publishing. Dagienė, V., & Sentance, S. (2016, October). It’s Computational Thinking! Bebras Tasks in the Curriculum. In International Conference on Informatics in Schools: Situation, Evolution, and Perspectives (pp. 28-39). Springer International Publishing. Vaníček, J. (2016, October). What Makes Situational Informatics Tasks Difficult?. In International Conference on Informatics in Schools: Situation, Evolution, and Perspectives (pp. 90-101). Springer International Publishing. Hubwieser, P., Hubwieser, E., & Graswald, D. (2016, October). How to Attract the Girls: Gender-Specific Performance and Motivation in the Bebras Challenge. In International Conference on Informatics in Schools: Situation, Evolution, and Perspectives (pp. 40-52). Springer International Publishing. Dagienė, V., Stupurienė, G., (2016). Informatics Concepts and Computational Thinking in K-12 Education: A Lithuanian Perspective (Invited Paper). IPSJ Transactions on Computers and Education. Vol.2 No.1, 1–8. Hubwieser, P., & Mühling, A. (2015). Investigating the Psychometric Structure of Bebras Contest: Towards mesuring Computational Thinking skills. In A. Pears & Y.-T. Lin (Eds. ), Proceedings of the 3rd International Conference on Learning and Teaching in Computing and Engineering (LaTiCE). April 9-12, Taipei. Hubwieser, P., Mühling, A. (2014b). Playing PISA with Bebras. Proceedings of the 9th Workshop in Primary and Secondary Computing Education, ACM, 128–129. Tort, F., Drot-Delange, B. (2015). Visual Literacy in Introductory Informatics Problems. ISSEP'15, LNCS 9378, p. 175-182. Kalelioglu, F., Gulbahar, Y., Madran, O. (2015). A Snapshot of the First Implementation of Bebras International Informatics Contest in Turkey. ISSEP'15, LNCS 9378, p. 131-140. Yagunova, E., Pozdniakov, S., Ryzhova, N., Razumovskaia, E., Korovkin, N. (2015) Evaluation of Difficulty and Complexity of Tasks: Case Study of International On-line Competition “Beaver”. ISSEP'15, Slovenia. Yagunova, E., Pozdniakov, S., Ryzhova, N., Razumovskaia, E., Korovkin, N. (2015) Analyses of difficulty and complexity of items in international on-line competition “Beaver”, IFIP'15, Lithuania. Stupurienė, G., Dagienė, V., Pėlikis, E. (2015). Introducing Computational Thinking through a Contest on Informatics: Problem-solving and Gender Issues. Informacijos mokslai, ISSN 1392-0561, Vol. 73. Bellettini C., Lonati V., Malchiodi D., Monga M., Morpurgo A. and Torelli M., (2015). How Challenging are Bebras Tasks? An IRT analysis based on the performance of Italian students, in ITiCSE '15 Proceedings of the 2015 ACM Conference on Innovation and Technology in Computer Science Education, New York: ACM (ISBN 9781450334402), 27-32, 2015. Bojan Kostadinov, Mile Jovanov, Emil Stankov, Marija Mihova, Biljana Risteska Stojkoska, Different Approaches for Making the Initial Selection of Talented Students in Programming Competitions, Olympiads in informatics, ISSN: 1822-7732 (Print) 2335-8955 (Online), 2015, Vol. 9, 113–125, DOI: http://dx.doi.org/10.15388/ioi.2015.09. Fredrik Heintz, Linda Mannila, Karin Nygårds, Peter Parnes and Björn Regnell, (2015). Computing at School in Sweden -- Experiences from Introducing Computer Science within Existing Subjects. In: Proceeding of the 8th International Conference on Informatics in Schools:Situation, Evolution, and Perspective (ISSEP), 2015. Maciej M. Syslo, (2015). From Algorithmic to Computational Thinking: On the Way for Computing for all Students. ITiCSE '15 Proceedings of the 2015 ACM Conference on Innovation and Technology in Computer Science Education, Pages 1-1. Sysło, M.M., Kwiatkowska, A.B. (2015). Introducing a new computer science curriculum for all school levels in Poland. LNCS, 9378, 141–154. Pohl, W., Westmeyer, J. (2015). Content categories for informatics tasks. LNCS, 9378, 61. Pohl, W., Hein, H.W. (2015). Aspects of quality in the presentation of informatics challenge tasks. LNCS, 9378, 21–32. Maytarattanakhon, A., Akimushkin, V., Pozdniakov, S. (2015). Olympiad in computer science and discrete mathematics. LNCS, 9378, 94–105. Jašková, L., Kováčová, N. (2015). Bebras contest for blind pupils. In: Proceedings of the Workshop in Primary and Secondary Computing Education on ZZZ. ACM, 92–95. Dolgopolovas, V., Jevsikova, T., Savulionienė, L., Dagienė, V. (2015) On Evaluation of computational thinking of software engineering novice students. In: Proceedings of the IFIP TC3 Working Conference “A New Culture of Learning: Computing and next Generations”, 90–99. Hubwieser, P., & Mühling, A. (2014). Competency Mining in Large Data Sets - Preparing Large Scale Investigations in Computer Science Education. In A. Fred & J. Filipe (Eds. ), Proceedings of the 6th International KDIR - International Conference on Knowledge Discovery and Information Retrieval. Rome, Italy, 21.-24. October 2014. (pp. 315–322). Setúbal, Portugal: ScitePress. Baron, G.-L., Drot-Delange, B., Grandbastien, M., and Tort, F. 2014. Computer science education in French secondary schools: Historical and didactical perspectives. ACM Trans. Comput. Educ. 14, 2, Article 11 (June 2014), 27 pages. DOI:http://dx.doi.org/10.1145/2602486. Maciej M. Syslo, Anna Beata Kwiatkowska, (2014). Playing with computing at a children's university. WiPSCE '14 Proceedings of the 9th Workshop in Primary and Secondary Computing Education, 104-107. Valentina Dagiene, Linda Mannila, Timo Poranen, Lennart Rolandsson, Pär Söderhjelm, (2014). Students' performance on programming-related tasks in an informatics contest in Finland, Sweden and Lithuania. ITiCSE 2014: 153-158. Linda Mannila, Valentina Dagiene, Barbara Demo, Natasa Grgurina, Claudio Mirolo, Lennart Rolandsson, Amber Settle. Computational Thinking in K-9 Education. In: Michael Goldweber (Ed. ), ITiCSE-WGR’14, ACM, 2014. Lee, G., Lin, Y.T. & Lin, J. (2014). Assessment of Computational Thinking Skill among High School and Vocational School Students in Taiwan. In J. Viteli & M. Leikomaa (Eds. ), Proceedings of EdMedia: World Conference on Educational Media and Technology 2014 (pp. 173-180). Association for the Advancement of Computing in Education (AACE). Hubwieser, P., & Mühling, A. M. (2014). Playing PISA with Bebras. In : WiPSCE ’14, Proceedings of the 9th Workshop in Primary and Secondary Computing Education (pp. 128–129). New York, NY, USA: ACM. Combéfis, S., Wautelet, J. (2014). Programming trainings and informatics teaching through online contest. Olympiads in Informatics, Vol. 8, 21–34. Javier Bilbao, Concepción Varela, Eugenio Bravo, Miguel Rodríguez, Olatz García, Purificación González (2014). Using e-activities in pre university education for working specific and transversal competences. Recent Advances In Telecommunications, Informatics And Educational Technologies. ISBN: 978-1-61804-262-0, p.37-43. Pėlikis, E., Dagienė, V. (2014) Informatikos uždavinių sprendimo tyrimas: skirtumai tarp vaikinų ir merginų. // Studentų mokslinė praktika 2014, konferencijos pranešimų santraukos, I dalis, p. 89-91. Dagienė, V., Mannila, L., Poranen, T., Rolandsson, L., Stupurienė, G. (2014) Reasoning on children's cognitive skills in an informatics contest: findings and discoveries from Finland, Lithuania, and Sweden // Informatics in schools: teaching and learning perspectives : 7th international conference on informatics in schools : situation, evolution, and perspectives, ISSEP 2014, Istanbul, Turkey, September 22-25, 2014: proceedings /editors: Gülbahar, Yasemin, Karataş, Erinç. - Book series: Lecture notes in computer science, Vol. 8730. ISSN 0302-974. Cham : Springer International Publishing, 2014. ISBN 9783319099576. p. 66-77. Vanicek, J. (2014) Bebras Informatics Contest: Criteria for Good Tasks Revised // Informatics in schools: teaching and learning perspectives : 7th international conference on informatics in schools : situation, evolution, and perspectives, ISSEP 2014, Istanbul, Turkey, September 22-25, 2014: proceedings /editors: Gülbahar, Yasemin, Karataş, Erinç. - Book series: Lecture notes in computer science, Vol. 8730. ISSN 0302-974. Cham : Springer International Publishing, 2014. ISBN 9783319099576. p. 17-28. Kristan, N., Gostiša, D., Fele-Žorž, G., Brodnik, A. (2014) A High-Availability Bebras Competition System// Informatics in schools: teaching and learning perspectives : 7th international conference on informatics in schools : situation, evolution, and perspectives, ISSEP 2014, Istanbul, Turkey, September 22-25, 2014: proceedings /editors: Gülbahar, Yasemin, Karataş, Erinç. - Book series: Lecture notes in computer science, Vol. 8730. ISSN 0302-974. Cham : Springer International Publishing, 2014. ISBN 9783319099576. p. 78-87. Armoni, M., Gal-Ezer, J., (2014). Early computing education: why? what? when? who? ACM Inroads, Volume 5, Issue 4, December 2014, Pages 54-59. Dagienė, V., Stupurienė, G. (2014) Informatics Education based on Solving Attractive Tasks through a Contest. // Conference IFIP, KEYCIT 2014, p. 51-62. Stupurienė, G., Sutkutė, E. (2014) Kas slypi išmaniose technologijose: atrask dalyvaudamas konkurse „Bebras“. // Žvirblių takas. Nr. 2(114), p. 14-16. Bilbao, J., Bravo, E., García, O., Varela, C., & Rodríguez, M. (2014). Contests as a way for changing methodologies in the curriculum. In The European Conference on Education 2014 (pp. 123-132). Tort F., Kummer-Hannoun P. & Beauné A.. Engagement et motivations des enseignants du secondaire pour la passation d'un concours d'informatique. In proceedings of Didapro5: Sciences et technologies de l'information et de la communication (STIC) en milieu éducatif, Drot-Delange, B., Baron, G-L. & Bruillard, E.(eds), 2013, Clermont-Ferrand, France. Lessner, D., Vaníček, J. Bobřík učí informatiku I. Matematika - fyzika – informatika, Vol. 22, No. 5, p. 374-382, 2013. ISSN 1805-7705. Дагене, В. Международный конкурс по информатике и компьютерной грамотности «BEBRAS» // Компьютерные инструменты в школе, Выпуск №1, 2013, p. 44-47. Poranen, T. Tietotekniikan Majava-kilpailu suosio kasvaa. Dimensio, 2013, 5, p. 50-51. Ugdymo plėtotės centras. (2013) „Bebras“ švenčia jubiliejų. // UPC naujienlaiškis. Nr. 25 (72). Dagienė, V., Jonaitytė, I. (2013) Informatikos ir informacinių technologijų konkurse „Bebras“ pirmą kartą varžėsi pradinukai. // Žvirblių takas. Nr. 2(108), p. 20-24. Van der VEGT, W. Predicting the Difficulty Level of a Bebras Task. Olympiads in Informatics, 2013, Vol. 7, 132-139. ISSN 1822-7732. Dagiene, V., Futschek, G. Bebras, A Contest to Motivate Students to Study Computer Science and Develop Computational Thinking. Vortrag: WCCE 2013, Torun; 01.07.2013 - 07.07.2013; in:"learning while we are connected, vol 3, book of abstracts", N. Reynolds, M. Webb, M. Syslo, V. Dagiene (Hrg. ); (2013), ISBN: 9788323130956; S. 139 - 141. Yagunova, E., Ryzhova, N. (2013). Use of protocols of online competitions for an assessment of complexity of tasks and increase of a validity of measuring procedure. Komp'ûternye instrumenty v obrazovanii. Vol. 6, pp.33-44. Gujberová, M.: iBobor v informatickej výchove. In: Journal of Technology and Information Education, Vol. 5, No. 1 (2013), s. 81-88. Matevž Černe (2013). Computer science concepts in tasks from the Bebras competition. EngD thesis. Gujberová, M., Kalaš, I. (20130 Designing productive gradations of tasks in primary programming education. WiPSE '13 Proceedings of the 8th Workshop in Primary and Secondary Computing Education, p. 108-117. Dagiene, V., Futschek, G. Knowledge construction in the Bebras problem solving contest. Conference: Constructionism, 2012. Kalaš, I., Laval, E., Laurillard, D., Lim, C. P., Meyer, F., Musgrave, S., & Turcsányi-Szabó, M. (2012). ICT in Primary Education. Analytical Study. Volume 1: Exploring the origins, settings and initiatives. UNESCO Institute for Information Technology in Education, Moscow, Russian Federation. Vaníček, J. Potenciální a skutečný dopad informatické soutěže do změn kurikula ICT v České republice. In Kalaš, I. (ed.) DidInfo´12. Banská Bystrica: Univerzita Mateja Béla, 2012, p. 15-24. ISBN 978-80-557-0342-8. Gujberová, M.: Úlohy súťaže iBobor pre najmladších žiakov. In: DidInfo 2012 [elektronický zdroj], Banská Bystrica : Univerzita Mateja Bela, 2012 S. 75-82. Cartelli, A., Dagiene, V., & Futschek, G. (2012). Bebras contest and digital competence assessment: Analysis of frameworks. Current Trends and Future Practices for Digital Literacy and Competence, 35. Tort F., Dagiene V., Concours Castor - découvrir l'informatique autrement, dans L'éducation aux cultures de l'information, E-Dossiers de l'audiovisuel, ina sup. 2010. Online publication. Tomohiro Nishida, Susumu Kanemune, Seiichi Tani. Consideration of the Questions for Bebras Contest in the International Workshop [in Japanese]. Information Processing Society of Japan (IPSJ), p. 1-6, 2012. Haberman, B., Cohen, A., Dagienė, V. The beaver contest - attracting youngsters to study computing. Innovation and technology in computer science ITiCSE' 11 : proceedings of the 16th annual conference, June 27-29, 2011, Germany Darmstadt, 2011. ISBN 9781450306973. p. 378. Bell T., Curzon P., Cutts Q., Dagiene V., Haberman B. (2011) Overcoming Obstacles to CS Education by using Non-Programming Outreach Programmes // Informatics in schools: contributing to 21st century education, I. Kalaš, R. T. Mittermeir (eds), LNCS 7013, Springer, pp. 71–81. Dagiene, V., Futschek, G. Workshop: Developing Algorithmic Thinking Through a Contest. Vortrag: IFIP TC3: ICT and Informatics in a Globalized World of Education, Mombasa; 16.08.2011 - 19.08.2011; in:"ICT and Informatics in a Globalized World of Education, Book of Abstracts", IFIP, Mombasa (2011), S. 34. Dagienė, V. (2011) What kinds of tasks are good for contests? // 6th Inter. Conf. Creativity in Mathematics Education and the Education of Gifted Students, Riga, Latvia, pp. 62–65. ISBN 9789984453606. Dagienė, V., Kašuba, R. (2011) “Kangoroo” and “Beaver” – the contests for all pupils to be more interested in mathematics and informatics // 6th Inter. Conf. Creativity in Mathematics Education and the Education of Gifted Students, Riga, Latvia, pp. 56–61. ISBN 9789984453606. Bell T., Curzon P., Cutts Q., Dagiene V., Haberman B. (2011) Introducing Students to CS With Programmes That Don't Emphasise Programming. ACM ITiCSE, Germany, Darmstadt, pp. 27–30. Dagiene, V., Jevsikova, T. (2011) Informatics concepts in secondary school education: What should we teach? Proceedings of International Conference IIGWE 2011 (ICT and Informatics in a Globalized World of Education). Mombasa, Kenya, August 16–19 d.
Haberman, B., Averbuch, H., Cohen, A., and Dagiene, V. (2011) Work in Progress - Initiating the Beaver Contest on Computer Science and Computer Fluency in Israel. 41 st ASEE/IEEE Frontiers in Education Conference. October 12-15, 2011, Rapid City, South Dakota. 978-1-61284-469-5/11/$26.00 pp. [1-2]. Dagienė, V., Jonaitytė, I. Septintasis informacinių technologijų konkursas "Bebras". Kompiuterininkų dienos - 2011. Vilnius: Žara, 2011. ISBN 9789986342625. p. 66-77. Susumu Kanemune, Yukio Idosaka, Toshiyuki Kamada, Seiichi Tani, Etsuro Moriya. Reporting Trial of Bebras Contest for K12 students in Japan. IPSJ SIG Notes, 2011-CE/ 3, 1-8. Seiichi Tani, Susumu Kanamune, Yoshiaki Nakano. Report on the Internationl Bebras Workshop 2011. IPSJ SIG Notes, 2011-CE/ 111, 1-5. Hyyrö, H., Mäkinen, E., Poranen, T., & Laaksonen, A. (2011). Koululaisten tietotekniikkakilpailut Suomessa. Cartelli, A., Dagiene, V., Futschek, G. (2010) Bebras Contest and Digital Competence Assessment: Analysis of Frameworks // International Journal of Digital Literacy and Digital Competence. Vol. 1 (1), IGI Pub., p 24–39. ISSN 1947-349-4. Dagienė, V. Sustaining informatics education by contests. Lecture notes in computer science. ISSN 0302-9743. Vol. 5941 (2010), P. 1-12. Dagiene, V., Futschek, G. (2010) Introducing Informatics Concepts through a Contest. // IFIP working conference: New developments in ICT and education. Amiens: Universite de Picardie Jules Verne. ISBN 9782953728514. Dagienė, V., Jonaitytė, I., Paltanavičius, A. Tarptautinės informacinių technologijų varžybos: modelis ir patirties analizė. Informacijos mokslai. ISSN 1392-0561. T. 53 (2010), p. 86-99. Dagienė, V. Pagrindinių informatikos konceptų ugdymas pasitelkiant varžybas. Pedagogika. ISSN 1392-0340. T. 98 (2010), p. 91-99. Futschek, G., Der Biber der Informatik. In:"25 Jahre Schulinformatik", herausgegeben von: OCG; OCG (Österreichische Computer Gesellschaft), Wien, 2010, ISBN: 978-3-85403-271-7, S. 202 - 205. Poranen, T. Tietotekniikan Majava-kilpailu saapui Suomeen. Dimensio, 2009, 5, p. 10-11. Vaníček, J. Rozvoj informatických kompetencí žáků pomocí soutěže: kauza Bobřík informatiky [online]. In: Sborník konference Počítač ve škole. Nové Město na Moravě: Gymnázium Vincence Makovského, 7. - 9. 4. 2009. 6 p.
Kalaš, I., Tomcsányiová, M. (2009) Students’ Attitude to Programming in Modern Infor­matics. Accepted for the IFIP World Conference on Computers in Education, Bento Goncalves, Brazil, 2009. Futschek G., Dagienė V. A contest informatics and computer fluency attracts school students learn basic technology concepts. In: Proc. 9th WCCE 2009, Education and Technology for a Better World, 9th WCCE 2009, Bento Goncalves; 2009, ISBN: 978-3-901882-35-7; Paper-Nr. 120, 9 p.
Dagiene V., Futschek G. Bebras International Contest on Informatics and Computer Literacy: A contest for all secondary school students to be more interested in Informatics and ICT concepts. In: Proc. 9th WCCE 2009, Education and Technology for a Better World, 9th WCCE 2009, Bento Goncalves; 2009, ISBN: 978-3-901882-35-7; Paper-Nr. 161, 2 p.
Dagiene V. Supporting computer science education through competitions. In: Proc. 9th WCCE 2009, Education and Technology for a Better World, 9th WCCE 2009, Bento Goncalves; 2009, ISBN: 978-3-901882-35-7; Paper-Nr. 76, 10 p.
Dagienė, V. Lietuvą garsina konkursas „Bebras“. Švietimo naujienos, 2009, Nr. 9/284, p. 26. Pohl, W., Schlüter, K., Hein, H. W., & Verlässliche, I. T. (2009). Informatik-Biber: Informatik-Einstieg und mehr. In INFOS (pp. 38-49). Kluszczyński, R., Mikulski, Ł., Nowicki, M., & Bała, P. (2009, January). Contests Hosting Service as a tool to teach programming. In Annales UMCS, Informatica (Vol. 9, No. 1, pp. 213-224). Dagienė, V., Futschek, G. Bebras International Contest on Informatics and Computer Literacy: Criteria for Good Tasks. In: R. T. Mittermeir, M. M. Syslo (Eds. ), Lect. Notes in Computer Science, vol. 5090. Informatics Education – Supporting Computational Thinking, 2008, 19–30. Dagiene, V. (2008) The BEBRAS Contest on Informatics and Computer Literacy – Students’ Drive to Science Education // In: Joint Open and Working IFIP Conf. : ICT and Learning for The Next Generation, 7-10 July, 2008, Kuala Lumpur, Malaysia, pp. 214–223. Dagienė, V., Jonaitytė, I. Informacinių technologijų konkursas „Bebras“ švenčia penkmetį // Švietimo naujienos, Nr. 19 (274), 2008, p. 12. Dagienė, V. Kūrybinis informacinių technologijų konkurso „Bebras“ seminaras Torunėje // Švietimo naujienos: Olimpiados, konkursai, Nr. 13 (268), 2008, p. 26. Dagienė, V., Zajančkauskienė, L. Informacinių technologijų konkursas „Bebras“ // Informacinės ir komunikacinės technologijos mokykloje: Pranešimų rinkinys, Vilnius, 2008, p. 38–40. Dagienė, V., Žalys, E. Devynių šalių „bebrai“ vėl renkasi Pasvalyje... // Lietuvos aidas / Naujausios žinios. Nr. 101 (645), 2007 m. gegužės 5 d., p. 1. Opmanis, M., Dagienė, V., Truu, A. Task Types at “Beaver” Contests Standards // In: V. Dagienė, R. Mittermeir (Eds. ), Proc. of the 2nd Int. Conference "Informatics in Secondary Schools: Evolution and Perspectives", Vilnius, 2006, pp. 509–519. Dagienė, V. Information technology contests – introduction to computer science in an attractive way // Informatics in Education, 5(1), 2006, p. 37–46. ISSN 1648-5831. 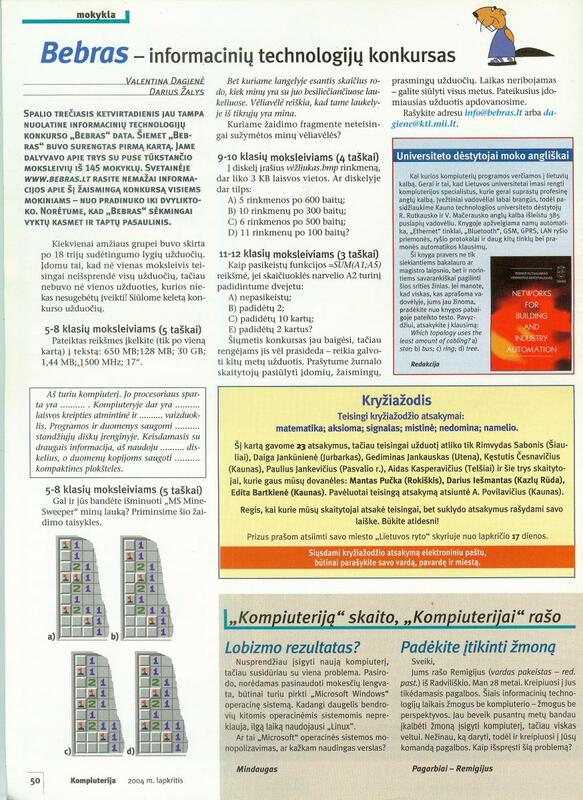 Dagienė, V., Žalys, D. Bebras – informacinių technologijų konkursas // Kompiuterija, 11(87), 2004, p. 50. News from press conference for the 2017 Bebras Challenge Contest in China (Qianlong.com). 12th Bebras Challenge in Slovenia. 12th Bebras Challenge in Lithuania.